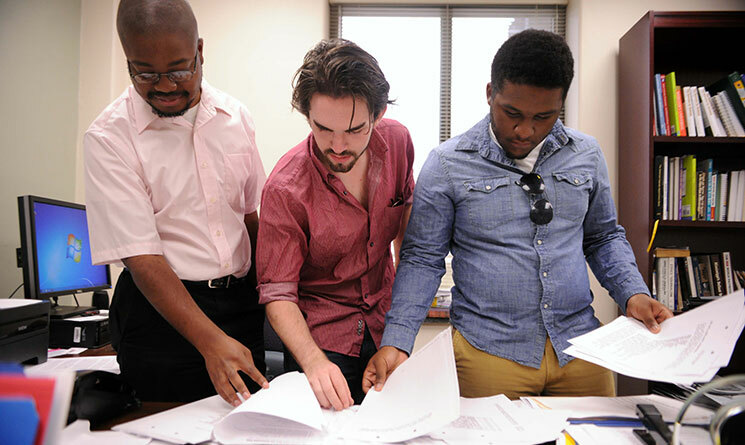 From left, cold case researchers Wilborn Nobles III, Gordon Brillon and Joshua Jackson review materials to build the program’s interactive website. In a world of instantaneous communication—Twitter, Facebook and headline tickers—timeliness is one of the most relevant aspects of modern journalism. The idea of getting the day’s top story first is paramount, so why did five LSU mass communication students spend a week digging through the National Archives in Washington, D.C., researching cold case civil rights murders in 1960s rural Louisiana? The graduate and undergraduate students first traveled to D.C. in 2011 as part of the field experience capstone course taught by James Shelledy, the Manship School’s Fred Jones Greer Chair. Shelledy, who spent 30 years as an investigative reporter and editor for several newspapers before joining the Manship faculty in 2005, felt the opportunity was essential in educating today’s journalists. The spring field trip to scrutinize the previously unseen 45-year-old FBI field investigations primarily focused on the 1964 murder of Frank Morris, a successful Ferriday, La., businessman and black civic leader who died when the Ku Klux Klan torched his shoe repair shop. The initial trip netted some 2,000 pages of mostly unpublicized material housed at the National Archives. Since that initial trip, students participating in the Unsolved Civil Right-Era Murders project have spent countless hours poring through nearly 100,000 pages of FBI files (obtained under the Freedom of Information Act) and meeting with the FBI to help bring closure to unsolved murders by the Ku Klux Klan. Graduating students in Shelledy’s capstone classes have filed dozens of Freedom of Information Act requests for FBI investigative reports and closed testimony to the House Un-American Activities Committee, which investigated Klan activities from 1965-67. Recently, to support the students’ work, the Ethics and Excellence in Journalism Foundation granted the LSU Foundation $25,000 to support investigative costs for the Unsolved Civil Right-Era Murders project, and to construct an interactive website for the files.